The aim of this study was to examine whether differences in the provenances of canopy tree species affect the community of soil invertebrates. We used a common garden, where Cryptomeria japonica trees (Yoshino, Yanase, Itoshiro and Yaku) from four provenances were planted separately in each plot. In these plots, we measured the concentration of nutrients in leaves, litter and roots; Sr isotope ratio (87Sr/86Sr) of leaves; root exudation rate of organic acids; exchangeable nutrients in soil and soil parameters such as soil pH; and abundance and composition of soil invertebrates. Some parameters that may affect nutrient dynamics (concentration of nitrogen in roots, root exudation rate of organic acids, tree growth) and concentrations of calcium and phosphorus in leaves and soil were significantly higher in the Yoshino plot than in the other plots. The 87Sr/86Sr of leaves suggested that the cycling of nutrients such as calcium differed significantly between the plots. Furthermore, the abundances of soil invertebrates that are likely to be affected by nutrient concentrations (e.g. soil crustaceans) were significantly higher in the Yoshino plot than in the other plots. 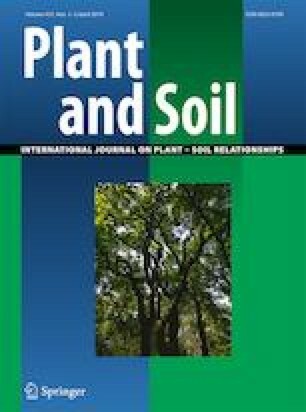 The effects of the provenance of a canopy tree species shape the soil invertebrate abundances and composition by altering the concentration of nutrients in the soil. The online version of this article ( https://doi.org/10.1007/s11104-019-03983-5) contains supplementary material, which is available to authorized users. We thank staff members of Wakayama Experimental forest, Hokkaido University, for their support of field survey. We also thank Y. Fuchigami, S. Koho, J. Kurata, K. Shin, S. Ueda, A. Yasuda and N. Yuzen for their support of chemical analysis. We appreciate comments made by Dr. M. Ueda as pre-submission reviewer. This study was conducted by the support of grant from Japan Society for the Promotion of Science (17 J07854 to TO and 25660111, 15 K14743 to TH), Climate Change Adaptation Research Program of NIES, Japan to TH, and Joint Research Grant for the Environmental Isotope Study of Research Institute for Humanity and Nature.